Ombre is a trend that has staying power. It’s found its way into classic art, our closets in the 90’s when it could be found in nearly any clothing store and now it’s splashed across the walls of our homes. There’s a reason why this trend keeps on coming back again and again—it’s an artistic technique that’s stunning, mesmerizing even. Whether it’s presented in a single color or a kaleidoscope of hues, moving from dark to light or vice versa is an effect we won’t be tiring of anytime soon. There are several ways to achieve the ombre look on a wall. You can hand-paint it yourself by dividing the wall into two or three sections, and while still wet, blend them together. You can spray-paint it—just check Pinterest for a tutorial. Or, you can skip painting altogether and purchase ombre wallpaper instead. Any way you do it, you’re sure to achieve that striking ombre effect. The aesthetic can also be applied to elements in your home that go beyond walls, like shelves or crown molding. And ombre also has this cool way of working in nearly every décor style you can imagine. Tropical? Use warm, bright colors to recreate a sunset. Traditional? Find a subdued shade that honors the classic feel of the room. Minimalist? Let the ombre wall be the center of attention and nothing else. These stylists, homeowners and other pros have got this ombre thing down pat, seen here in these 10 spaces. These shelves, captured by photographer, interior designer and artist Nicole Cohen, are anything but boring. In gradual shades of peach that move into orange, each shelf represents its own section of the ombre rainbow, making these ceramic pieces the stars of the show. Even old-school, traditional spaces can get a little boost thanks to some paint and ombre effects. In this sitting room spotted by textile designer Chanee Vijay, ombre takes a respectful, classic turn in shades of taupe and mauve, accentuating the crown molding and patterned walls throughout. Although antique at its roots, the space now looks decidedly modern. For a fresh and fun look, portray the vibrancy of a sunset on your bedroom wall. 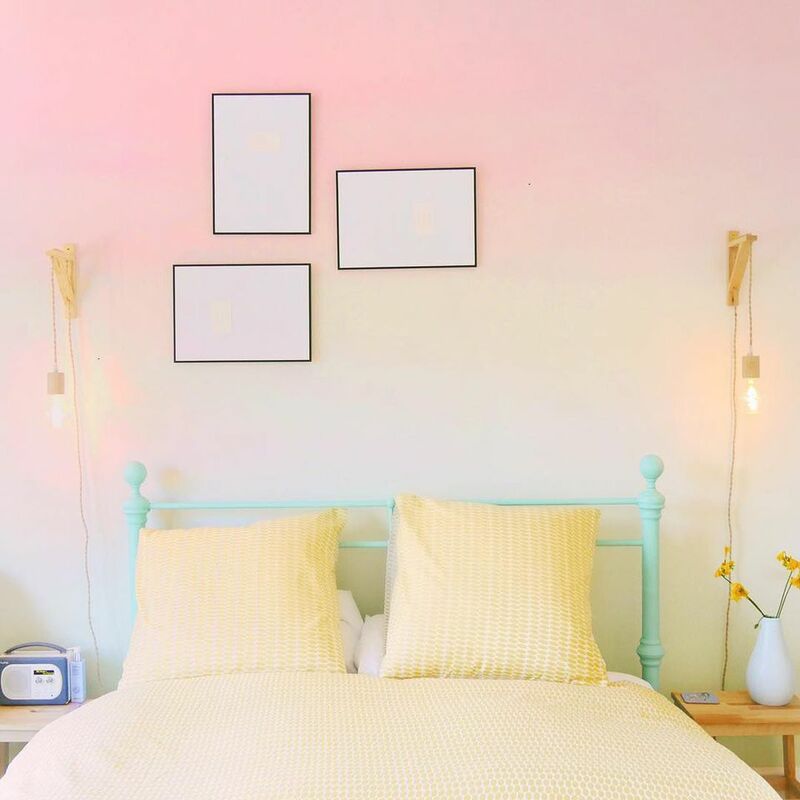 Kasie Barton has done this on her own bedroom wall, bathed in pinks, yellows and whites. A sea-green bed adds another jolt of color. Who needs to go to the beach if this is what your bedroom looks like? An ombre accent wall can do a lot for a room, including making design elements stand out. If you choose a dark color for your ombre wall, you can match it with black accents that will pop. In this bedroom styled by Emma Fishman, the moody blue hues of the ombre wall are in perfect harmony with the black details, exemplified through wall art, a pendant light and black patterning in the linens. The embroidery hoop wall art hung by photo stylist Anuschka Odau looks even prettier set against an ombre accent wall. In this case, two very different colors, pink and green, surprisingly work flawlessly next to one another, and instead of the tried-and-true ombre pattern, bottom to top, this wall’s ombre goes from side to side. This styling goes to show that creating an ombre wall is a creative venture—go wild! Sometimes, an accent wall serves as inspiration for an entire room. In this bedroom designed by Raili Clasen that nods to the surf lifestyle, a green, purposely-unfinished ombre wall anchors the other greens throughout the space—the linens, lamp, area rug and even the surfboard. If you love a single color, ignore “design rules” and cover a room in it—and an ombre wall can punch up the fun. Unique décor objects are even more noteworthy when juxtaposed against an ombre wall. 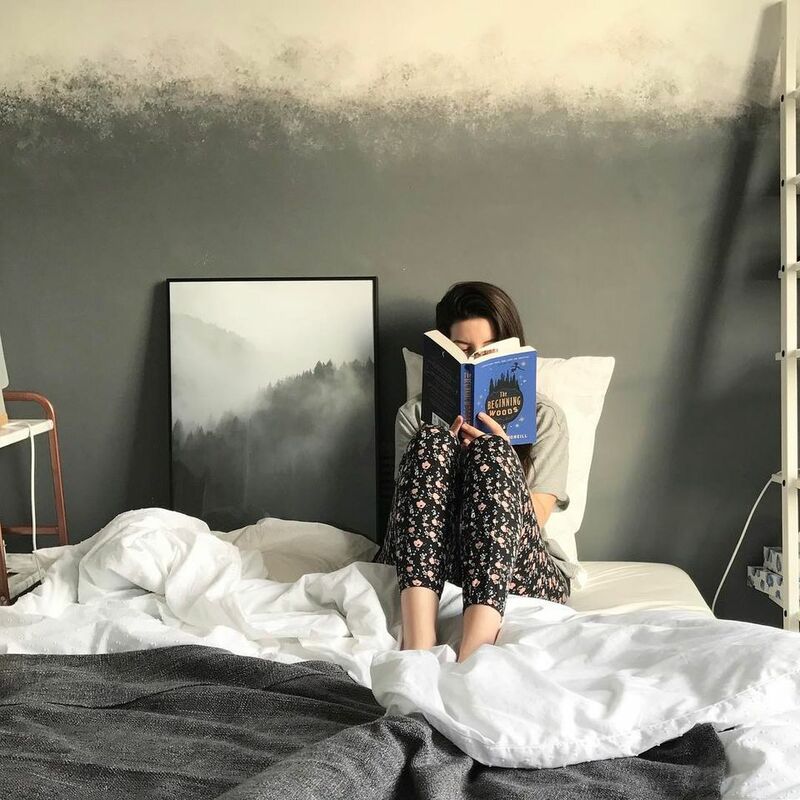 Designer and illustrator Flavia Cabrera has done just that in this shot from her home, in which blacks, grays and whites punctuate objects on a shelf—books, a potted plant and small treasures. An ombre wall doesn’t need to be swathed in dark colors or obvious distinctions to be noticeable. Here, Caroline of her interior styling website Nine Green Bottles makes pastel shades look dreamy and modern, with a very light green ombre wall, jugs filled with pink water and a piece of whimsical artwork. Or, if you’re on the other side of the spectrum, perhaps you’re drawn toward accent walls covered in dark colors. That’s the preference displayed by Brittany of @ourfortknox, seen here in her living room. Hazy grays and blacks work together to set a dramatic tone, which are pleasantly-unexpected in a breezy, bohemian space. An ombre wall is a great option for a minimalist homeowner. Since it carries enough of its own visual impact, there’s really no need to hang wall art or include other décor items. This is showcased well in this dining room covered in wallpaper created by The Detroit Wallpaper Co. A table with simple décor items, chairs, a light and an ombre accent wall is all that this room needs.